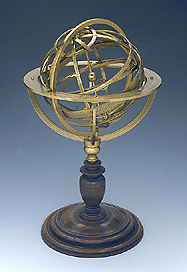 The place of construction of this armillary sphere is given on the meridian circle as Rome along with the date of construction (1578) and the initials 'Car. PL.'. The style in which the instrument is constructed and the nature of the inscriptions suggest an attribution to the instrument maker Carlo Plato, active in Rome in the second half of the 16th century. The sphere is mounted on a base of turned wood. It was purchased in the second half of the nineteenth century by the director of the Museum of Physics and Natural History, Ferdinando Meucci.